Welcome to December! If you missed our Cyber-Monday sale, it’s okay, it’ll come back around next year. But, you don’t have to wait a whole other year, because our December promotion starts today! Give the gift of a portrait session to someone you love, or fill your own walls with the benefit of double the package prints! Every Portrait Session & Portrait Reservation made between today and December 23rd will enjoy double the package prints for free! Requirements: Simply choose any type of portrait service with any of our photographers, and reserve or book your session with a payment before December 23rd, 2018 to get double the included prints! This offer cannot not be combined with any other offers, credits, codewords, or rewards. All reservations must be held for at least 7 days prior to scheduling and redemption. Promotional requirements subject to change without notice. Fill out the form below and we’ll reach out to you to answer questions and finish things up, usually within the hour! What’s the difference between a ‘Portrait Booking’ and a ‘Portrait Reservation’? “Portrait Bookings” are portrait sessions you are ready to set up right now. A portrait reservation is a portrait session you (or someone you love) will set up later. What are ‘double package prints’? Each package we offer includes a collection of loose prints which you can use for framing, for photo albums, scrap booking and more. This promotion doubles them! 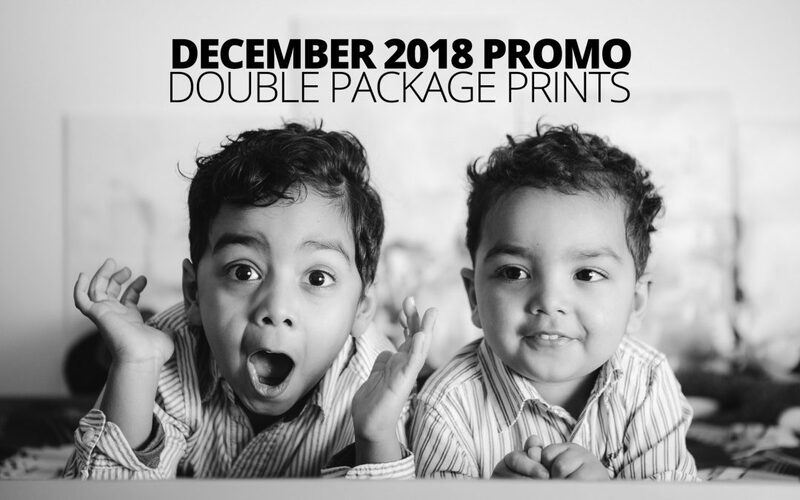 So for example, our Family Portraits package, includes One 8x10″ Print and Ten 4x6″ Prints, but with our December promotion, those prints are doubled to Two 8x10″ Prints and Twenty 4x6″ Prints! Does this promotion cover ordinary portrait bookings, or just reservations? This promotion is good for all portrait bookings and reservations. If you want to take advantage of this promotion for yourself, but don’t know when you want have the session, purchase a portrait reservation for yourself! Portrait reservations are like gift certificates. You can give them to friends or family as a gift, or you can take advantage of the savings and use the reservation yourself. Buy now, schedule when it’s convenient. Can I buy more than one portrait reservation? Yes, you can purchase as many portrait reservations as you like. The paid price of the reservation never expires, however the specific package reserved must be redeemed within one year. If the portrait reservation is not used within the year, the reservation will convert into a cash credit which can be used toward any kind of service we offer at the current non-promotional package price. How is a portrait reservation redeemed? Whoever holds the reservation simply needs to reach out to us when they are ready to schedule their session. Alternatively, if you provide us contact information for the reservation holder, we will reach out to them at the start of each season to see whether they are ready to schedule their session. When should the session be scheduled? We recommend providing at 3-6 weeks notice when scheduling for optimum flexibility. Last minute scheduling is often available as well, but with typically with significantly reduced flexibility. No, as long as the session is redeemed for the appropriate service (e.g., family portraits, couple’s portraits, etc), with the appropriate number of people, and held within our service area, there will be no additional charges. Can reservations be exchanged for a different kind of service? Yes! For example, if you purchase a reservation for Family Portraits, you can redeem the reservation for Couple’s Portraits instead. In that case, since Couple’s Portraits is a lower cost service, the difference in the price of the reservation will be converted into a print credit. Are there any additional requirements to redeeming a Portrait Reservation? To redeem a Portrait Reservation, we will have to pick a date, pick a location, and a standard portrait agreement will need to be signed by the person redeeming the reservation.